Looking to get a straighter smile? Are metal braces the first thing that come to mind when you think about straightening crooked teeth?The good news is that they don’t have to be the only thing you think of. Traditional wire braces are no longer the only way to straighten teeth. With Invisalign, Main Line patients like you can get the smile they’ve always wanted without the constraints of traditional braces. Want to learn more? Keep reading to discover the benefits of this modern treatment option. Invisalign is an orthodontic treatment that uses clear aligners that are accurately created with a digital scan of your teeth. 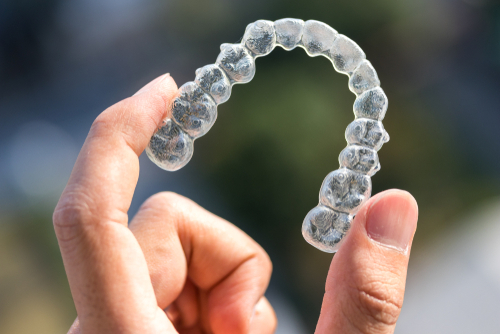 Your aligners are custom made from these scans to gradually shift and straighten your teeth.The aligners are worn at all times, except when eating and brushing your teeth. As your teeth shift into place, new sets of aligners are made to continue adjusting the placement until your teeth are where they belong. Easily removable— aligners makes eating and drinking easier and eliminate food restrictions. Low visibility— Invisalign has little impact on your appearance as they are almost invisible. Comfortable— aligners are trimmed to match each individual’s gum line, and you will never have to deal with uncomfortable wires. Trackable usage— a blue compliance indicator makes it easy to track whether teens are wearing the aligners enough. Hygienic— because the aligners are removable, brushing and flossing is easier and reduces the risk of plaque build-up. If Invisalign seems like the right choice for you, then you will want to find a dentist office which will be able to provide you with this treatment. Our new office on the Main Line provides convenient access to this desirable dental treatment. At Penn Dental Family Practice, we pride ourselves in providing a wide range of services and expert, personalized care to each of our patients. If you choose Penn Dental Family Practice for your Main Line Invisalign dentist office, then you can rest assured that you will be receiving the best care available. And, if you or other members of your family require additional dental care, we offer all dental specialities and treat patients of all ages. To learn more about getting an Invisalign treatment on the Main Line, or to schedule an appointment, contact us today by calling 215-898-7337.